Someone asked me the other day what was my favourite hobby, to which I automatically answered "sleeping". While I do in fact love sleeping, I am actually quite bad at it and never seem to do enough for it to properly be classified as a genuine hobby. "Sleeping" is my de facto answer for many questions ("What did you do last summer? What do you want to be when you grow up? Do you know the way to San Jose? ), it doesn't always make sense as a reply but it saves me having to think up something on the spot, for in truth I have never given much thought to questions of superlatives (What's your favourite book/film/colour/quest?) and to suddenly be put on the spot and have to think of something that won't cause the questioner to recoil in disgust and/or horror leads to one of those awkward pauses in the conversation where the other participants start to look concerned that you may have had a stroke. Responding immediately with "sleeping" normally gives me enough breathing space to either come up with a more acceptable answer, or to run. Anyway, lately I have been taking great joy in the simple act of heading out for a walk while listening to music. Headphones are terribly antisocial, and I think that is why I like them so much, but they are also a magic shield. A lone man walking down a street is often seen as an object of suspicion - who is he, why is he here, why does he have that crazed look in his eyes? However by simply wearing a pair of headphones, you are transformed into someone that has removed themselves from the street, by isolating yourself from the environment around you are somehow less menacing, you are suddenly just passing through and no longer loitering with intent. It's as if to be a part of the urban geography is now a suspicious act, that you are paying to much attention by not wrapping yourself in distracted separation, and thus you must be up to no good. Thus to truly be respectful of your fellow citizens, you must visibly separate yourself from them for their own comfort. Antisocial is the new social. So, as I love a good walk in the evening, I thus cloak myself beneath my headphones and set off to think great thoughts and enjoy a simple few stolen moments away from the draining demands of life, work and my fellow human beings. These moments are also, somewhat sadly, almost the only times I get to listen to music, what once once a far more central part of my life. 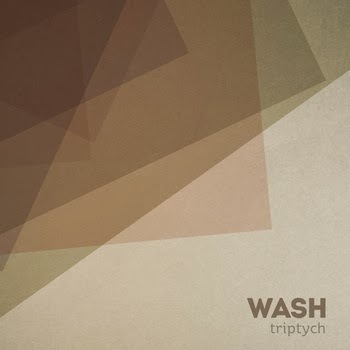 This week I have mostly been listening to Triptych, by WASH. A few years ago there was an unexpected exodus of friends to Cambodia. While emigration is nothing new to any social group in Ireland, the usual ports of call for mendicant potato-eaters are the UK, US and Australia, all places where our inability to master our own language let alone someone else's is generally not a problem. So believe me when I say that Cambodia is not a usual destination for us, and yet more of my friends now live in Phnom Penh than do in our traditional Ritzy-Sixy homeland of Rathmines and Ranelagh. WASH is a a collaboration between two of those friends, Warren Daly, founder of net label Invisible Agent, and Alex Leonard, more familiar to readers of this blog under his Ebauche moniker, with Hal FX rounding off the trio. Triptych is a 90-minute travelogue of electronica and spoken word, a journey in three lush movements that explore Phnom Penh itself, an uptempo frenetic trip across Europe and a final meditative reflection that blends together the travellers' mental fusion of the familiar and exotic, the home and the new, the sense that being elsewhere makes you greater than the simple sum of where you are and where you have been. Deep rolling electronic soundscapes overlayed with field recordings and the narrated thoughts of Scott Bywater do a pretty damn good job of transporting you away to somewhere that you've never been, yet seems achingly familiar at the same time. Triptych is available now on Bandcamp and elsewhere, you can find out more about it over at Invisible Agent. There is also a stunning-looking limited edition physical version available, with a booklet that includes the text of Bywater's narrative and some gorgeous looking artwork by Chhan Dina and Adrianna Snochowska. If you don't feel like walking then just sit back, turn the lights off and the music on and drift away. It really is altogether rather nice. Dave, thanks for your kind words. We're delighted you're enjoying Triptych. We have recorded our 2nd album and it should be ready sometime in 2014.